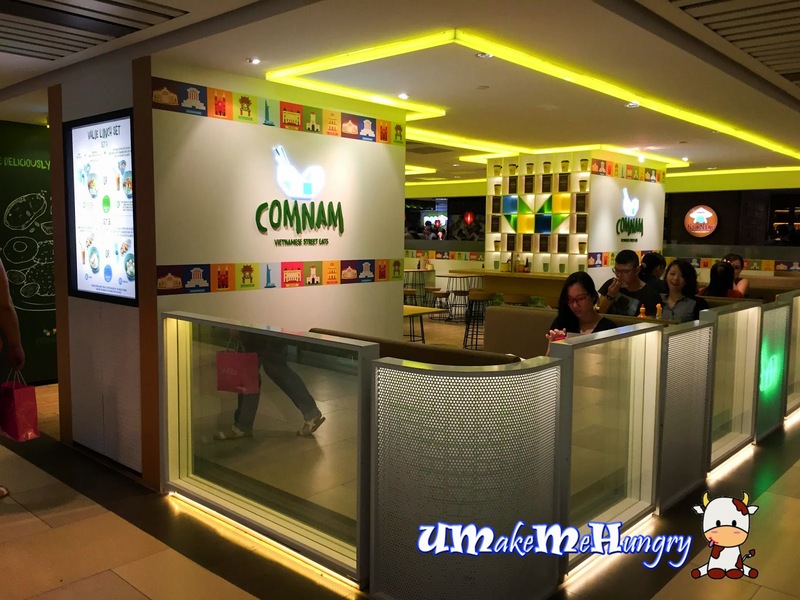 It's been a while I had heard about Comnam and its broken Rice bowl. 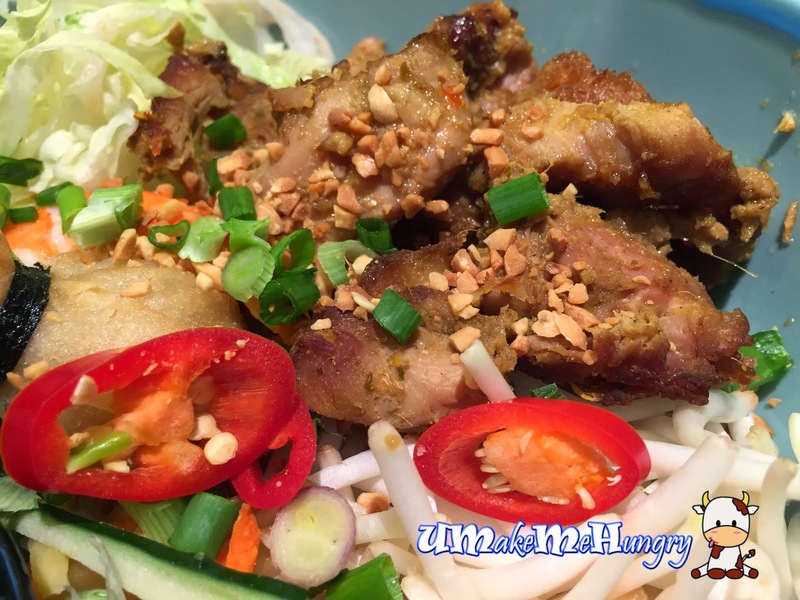 They are launched by the folks of NamNam Noodle Bar and there is no need for another question about its location as they are just located next to the Noodle Bar. Likewise, when you talk about MSG in their food, it does follow suit. Even the ordering concept is the same, just fill up the order on the piece of paper with pencil and proceed to the counter for payment and collection. 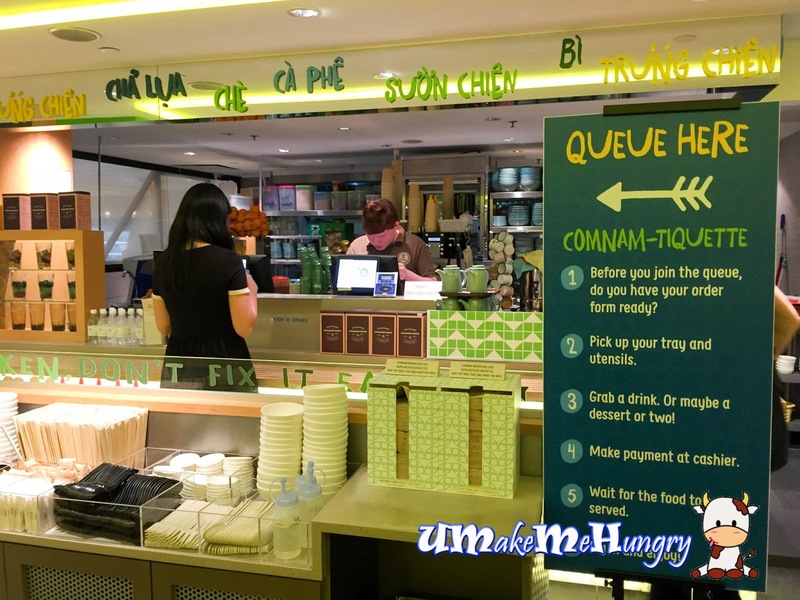 Comnam, when broken down and translated in Vietnamese refers to cooked rice (Com) and Nam Refers to Southern (Vietnam). Thus if you are thinking the origin of the broken rice dish, its actually from Saigon in South Vietnam. 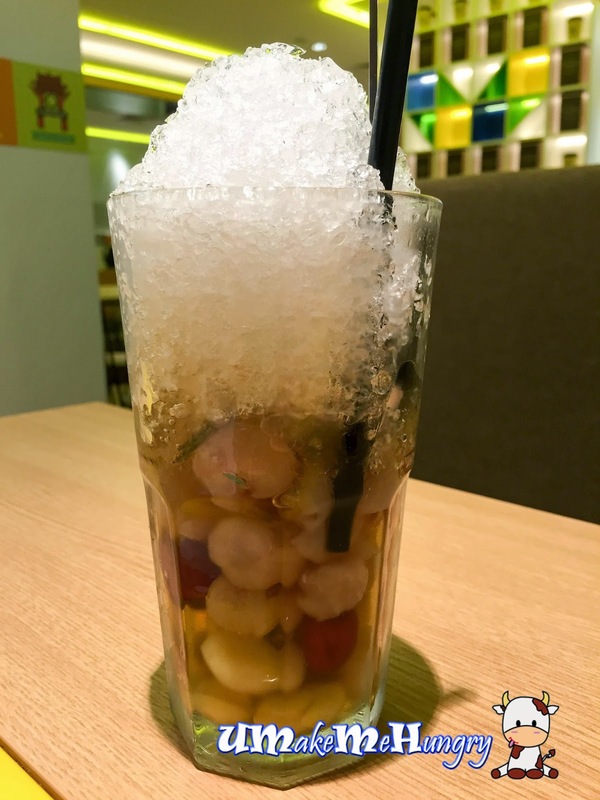 Having their desserts before the meal as drink, I find that this Che dried Longan, Lotus Seeds, Water Chestnut and seaweed was rather similar to our chinese dessert, Ching Tng. Served in a cup where ingredients were stacked up occupying half of it with shaved ice toppings over them. Sweetness was moderate and tasted refreshing. 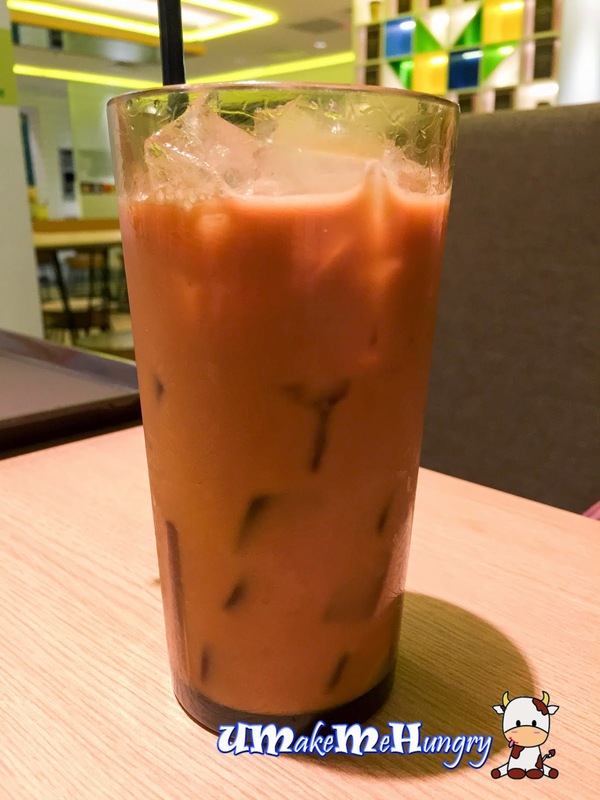 No dripping of Viet Black Coffee as we had ordered them in Cold Condensed milk Version. 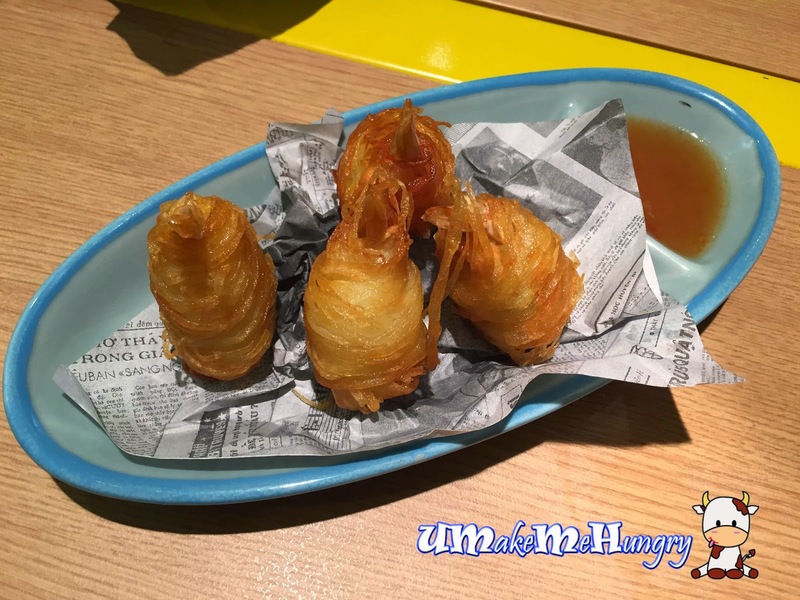 Crispy Potao String Shrimps were served in with a faux newspaper on its base, absorbing the grease from the fried stuff. This String Shrimps looked extremely delicate and indeed very crispy. A closer look at the curls, they were actually made up of yellow onion rings. Another side plate that is worth the order will be its calamari or rather cripsy squid on the menu. 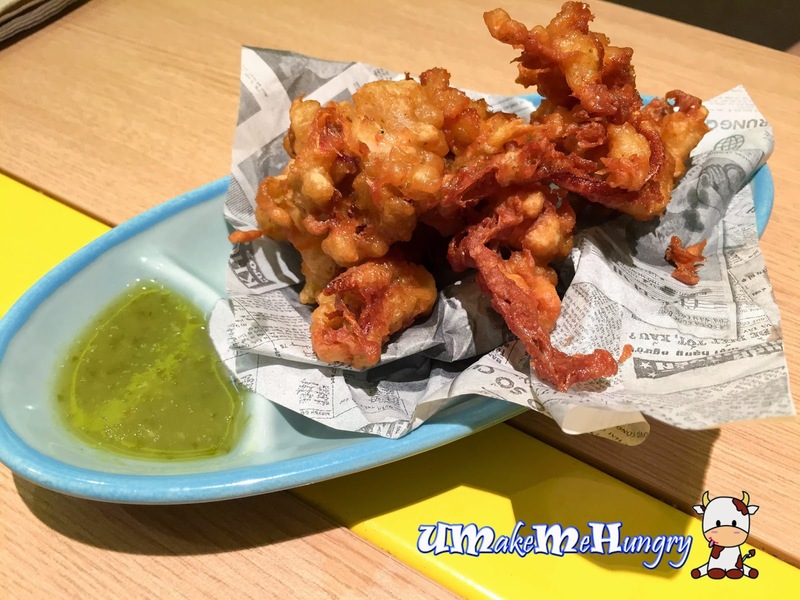 It was deep fried and also presented with a faux newspaper. Dipping them into the dill and green chillies sauce is indeed very appetizing. Besides having the traditional metal cup with ordering slip and pencil on the table. 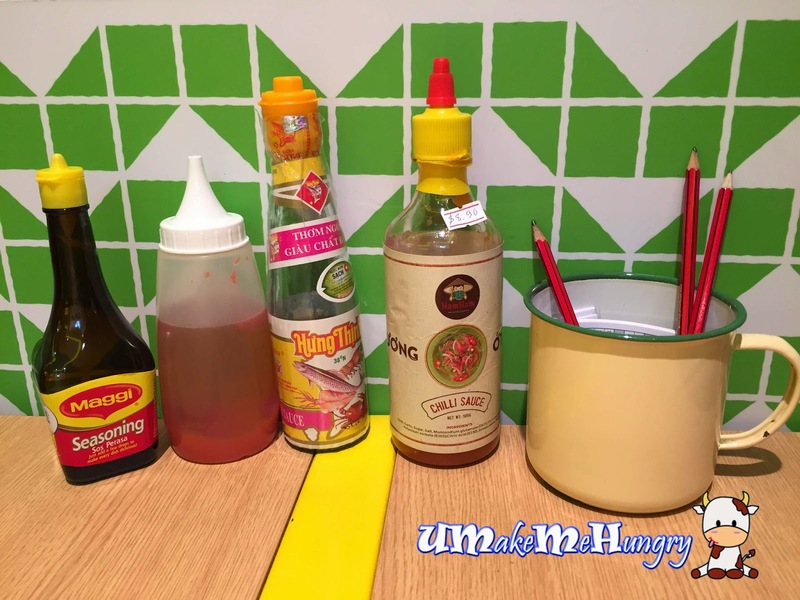 Seasonings and condiments were readily prepared on every table. 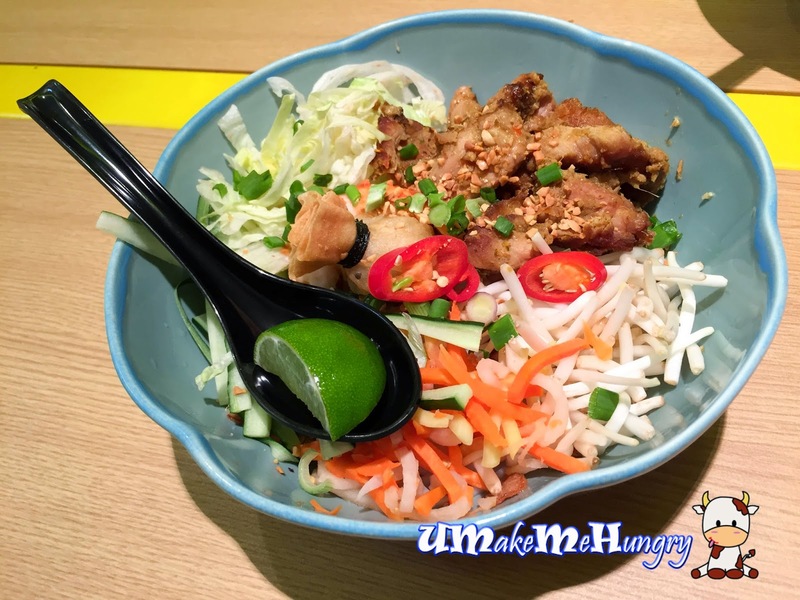 Presentation of the Dry Rice Noodles with Sauteed chicken, prawn, seafood money bag was a common sight of a bowl of Vietnamese food where you find raw shredded vegetables like carrot, cabbages and beansprouts on the bowl. Also, a lime wedge as a add on enhancing the taste of the food. 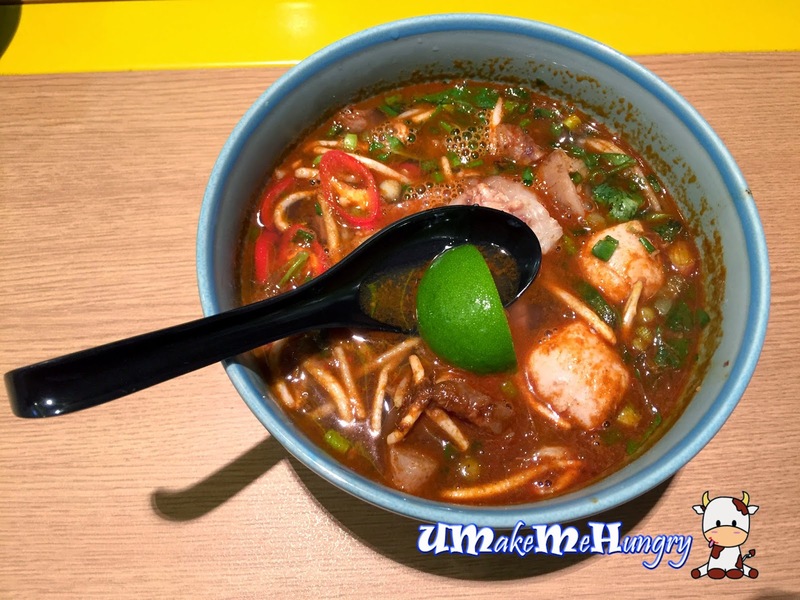 The Spicy Beef Rice Noodle soup gave out a strong heady scent of prawn paste and spiciness which kind of summarized its spicy level. 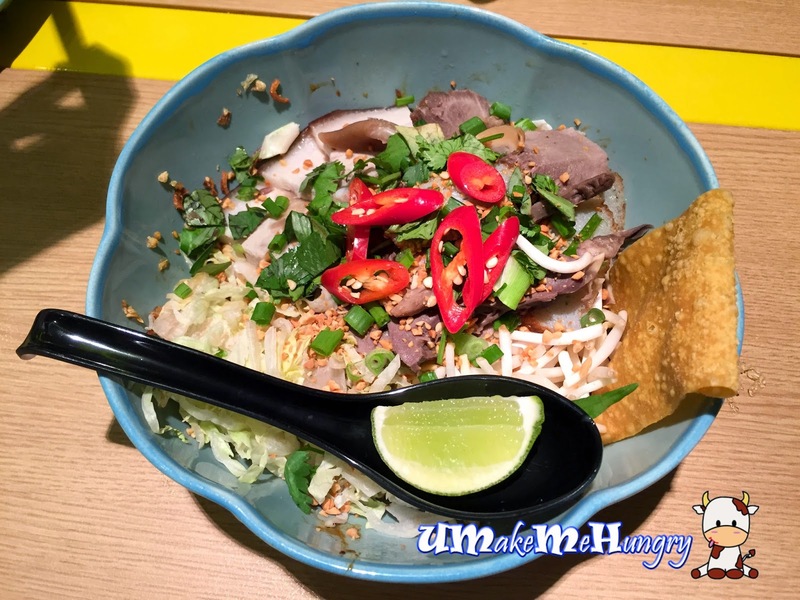 The bowl of spicy beef rice noodle include Pork Balls and bean sprouts. To minimize the spice level, adding lime juice will help. The Dry Pork Noodles came in a differently as compared to the two others Noodle ordered. Perhaps its more for someone who are more adventurous and love Pig Offal. 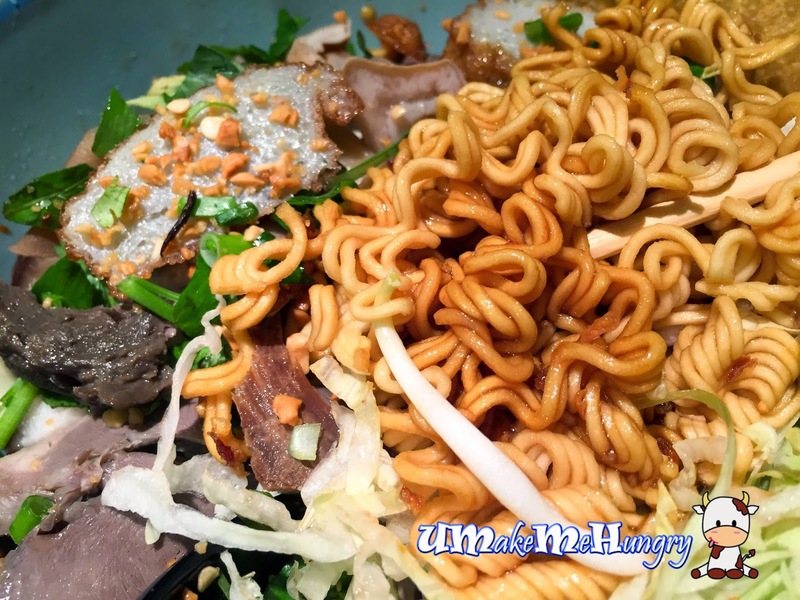 The bowl consist of fish cake, beansprouts and pig offals like intestines, heart and belly meats. Instead of Rice Noodles, these yellow curly noodles were served instead. Though it was supposed to be a "Rice" Place, we ended up ordering their noodles instead. Therefore, it gave me another reason to visit them again. Besides there are no GST or any service charge required.